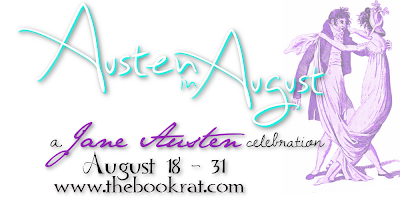 The Book Rat: JAFF Characters Austen Would Love — guest post from Claudine! JAFF Characters Austen Would Love — guest post from Claudine! Last week, Claudine joined us to review Stanley Michael Hurd's series, Darcy's Tale, in the style of a letter directly to Jane; today, she's joining us once again to share some more tidbits for Jane (and you! ), as she tells us about her favorite non-Austen-created characters from Austenesque fiction! And as a few of these are new to me, I think I've found some to add to my list of ever-growing to-reads! Take a look, and let us know some of your favorite JAFF characters (or interpretations) in the comments! My Favorite JAFF Characters that Jane Austen Would Have Loved! After reading nearly 100 JAFF books this year, I find that one of the best parts of reading these stories are the new characters I meet along the way. Not only does each JAFF author have a different take on our favorite characters from the book, but many JAFF authors create additional characters that help to round out their own stories in fresh and often, meaningful ways. As I reviewed the JAFF titles on my Kindle, a smile could be frequently found upon my face, as I remembered the JAFF stories below and the characters on this list, which for me, became as memorable as some of Jane Austen’s very own characters. I could give reasons for each character I have selected, or a memorable excerpt from each one; yet that isn’t the intended purpose of this list. I hope to inspire you to read the JAFF stories listed below, as you come to know and love, and yes, sometimes hate, these wonderful JAFF characters! Ahhh....I need to read more JAFF, clearly. Thanks- this is a good starting point! Yep, recognize a few of those. I adore the original characters that are added to the stories as much as those familiar. I have to add that Mary Simonsen's Lord Anthony who shows up in many of her P&P JAFF is a hoot. Obviously I need to read more JAFF. I don't think I've read any of these! I like oiginal characters. Mrs. Pencarrow was quite my favorite of the ones listed.